Before we get too far along here, let’s get one thing out of the way: I hate tinted windows. The darker the tint, the more I hate them. Add goofy stickers to the mix and you almost lose me, save for the fact that tint and stickers are probably the most easily rectified “personalization” of a car that you can have. Even if you don’t want to do it yourself (which I don’t) you can pay between $100-$150 to a shop to take care of it for you. Ask me how I know. So look at this car, but look beyond the tint and the stickers. You see that? Good. 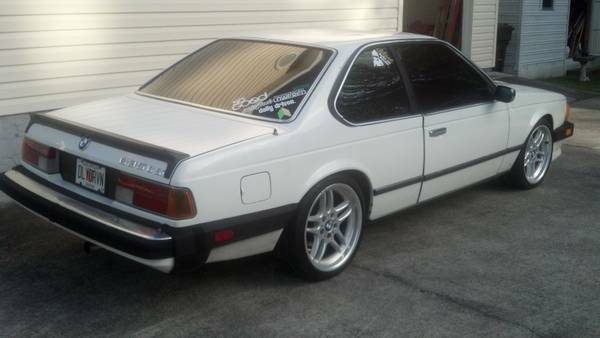 What you see is a clean Alpine White 1985 635CSi with dark tan “llama” leather interior. White isn’t my favorite color for just about any car, but it works here. 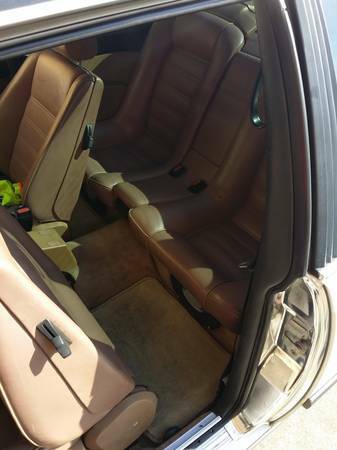 All the more so if you could see the sharp sport seats through the windows. The seller indicates that the vast majority of the paintwork is original, with just one panel having been repainted and maybe needing just a smidge of attention. Likewise the interior is remarkably clean save for a small hole in about the size of a pencil eraser in the outer bolster of the driver’s seat. Hey, we’re talking about a 29 year-old car. I wish I’d aged so well since then! 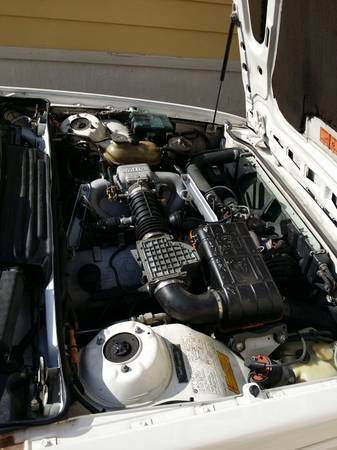 The seller also indicates that all the electrics work, and I would hope that includes the air conditioning. Sorting AC on these cars can be a hassle, and although it’s only mediocre when it’s working at it’s best at least in my part of the world I’d rather have it than not. But that would suggest that the power windows and locks all work right, as well as the finicky service indicator in the gauge cluster. 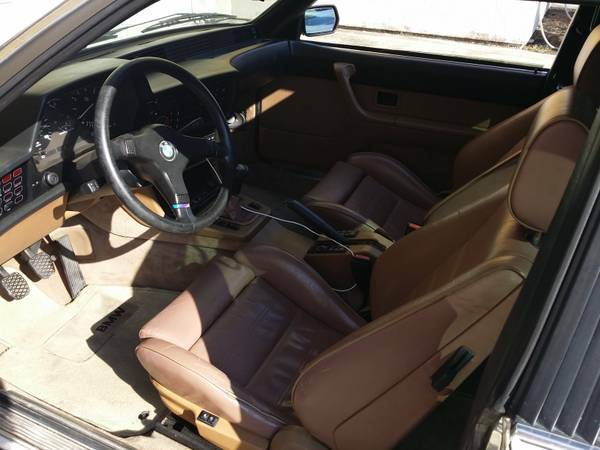 Speaking of the gauge cluster it is stated that just recently the seller’s father reset the trip odometer while the car was moving, which any driver of a BMW of this vintage knows means that the odometer has stopped working. Hopefully the description of time and miles elapsed since then is true, but it’s one of those things that I wish a seller would deal with instead of having to explain. It would just make life easier. At approximately 156,000 miles, the M30 inline-6 should have a lot of life left before it needs anything major. I would want to know about oil usage, however, having been the victim in the past of bad valve guide seals which meant a quart of oil every 300 miles or so. With 182hp this car is no slouch, aided further by the venerable Getrag 265 5-speed manual transmission. Make no mistake – this is a great gearbox and a joy to shift, assuming all is right with it. The Bilstein Sport shocks and H&R springs probably make for a bit of a jiggly ride on rough roads, but I’ll bet it is a blast on smooth sweepers. Big, loud exhaust may be questionable here, but I’d have to reserve judgment until I heard it. At the asking price it wouldn’t be catastrophic to have to refit a stock or at least more subtle exhaust. Then again, you just might like it. When I look at cars, I look for those signs of ownership that suggest that someone cared. Nice paint and interior? Obviously. But what about the details? 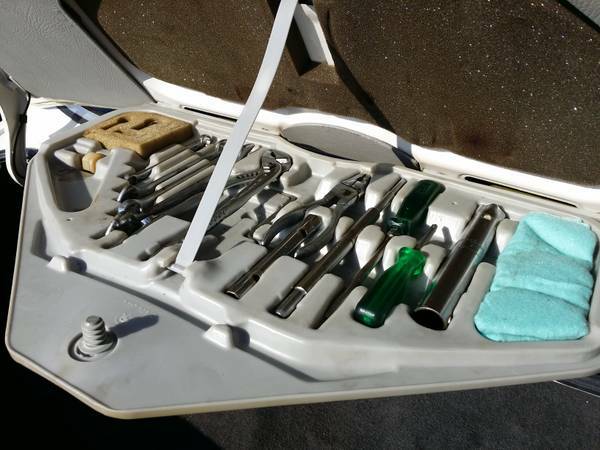 In this particular case, I love the tool kit. Every single tool is present and accounted for. What’s more, the little green rag is still folded neatly in its special tray. Add two sets of wheels and documentation, and I’m sucked-in. If there were space in the garage right now I’d be looking very hard at it. You do it before I do. Please! 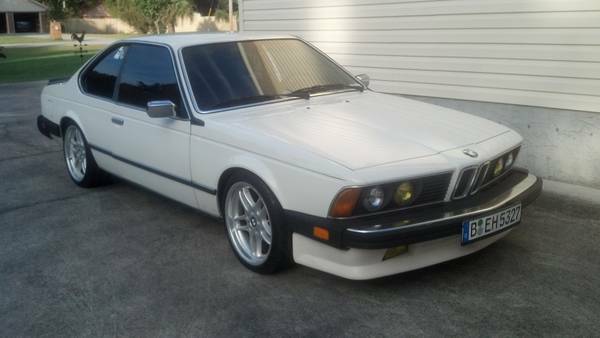 This entry was posted on Monday, August 4th, 2014 at 12:39 AM	and tagged with 1980s Dream Cars, 635CSI, Big Six, BMW, Bruce Willis, E24, Getrag 265, M30, Mercedes 560SEL, Moonlighting, Paul Bracq and posted in Totally That Stupid. You can follow any responses to this entry through the RSS 2.0 feed.